The temple is approached from the south via a cruciform platform, which connects the approach road to the southern gopura of the second enclosure. The platform is guarded by chinthes and balustered with naga railings, symbolizing its function as a "naga bridge" that links the world of men to the world of the gods. Beyond the platform rise the gopura and walls of the second enclosure, with the tower visible off in the distance. The temple at Phimai was begun during the reign of Jayavarman VI (1080-1107), and its sanctuary was dedicated in 1108. Other structures continued to be built in the temple, up through the reign of Jayavarman VII (1181-1219), who dedicated a statue of himself in one of the secondary shrines. Unusually for this period, and in spite of the many Hindu themes portrayed on its lintels and pediments, the temple was a Tantric Buddhist rather than a Hindu dedication. An imperial roadway connected the city and temple of Phimai directly to the royal capital at Angkor, 225 km (140 mi) south. This may account at least in part for the unusual, southern, orientation of Phimai's temple. The layout and dimensions of the surrounding town (third enclosure, 1020x580m) are comparable to Angkor Wat (1025x800m). Angkor Wat has a naga bridge (platform) like Phimai, but then so do many other Khmer temples. 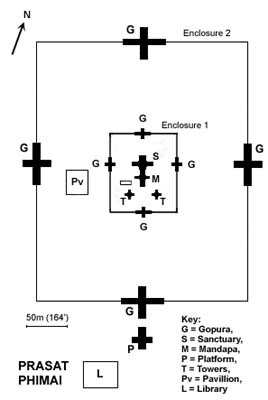 The Angkor platform fronts the temple itself (first enclosure), while at Phimai the platform opens onto the second enclosure (see plan, above). Another connection to Angkor Wat is the distinctive shape of the tower of the central sanctuary, which is basically the same in both temples. Since Angkor Wat was built later, a natural hypothesis is that it inherited some of these design features from the earlier Phimai temple. However, the sanctuary plan for Angkor Wat, with its five towers, is incomparably grander and more developed than the simple mandapa, sanctuary, and single tower layout at Phimai.